I’m at Disney World with CJ, on a Pirates of the Caribbean-style ride, a car careening through a tunnel. On the wall of the tunnel there are math posters, the kind you’d see in a high school classroom, about Pascal’s triangle, conic sections, etc. And I feel sort of annoyed and depressed, because I know that Disney is going to make a big deal about how educational this ride is, but actually, nobody except me is looking at the posters, nobody who didn’t already know the math could get anything out of the posters, the way the car speeds down the track. Please interpret and derive relevant policy prescriptions for math pedagogy in comments. First, I cannot stress enough the cult-like powers of a PhD program. Doctoral programs can have a strong influence on the weak-minded. Even if you’re pretty sure what you want going into a program, that can change as you’re surrounded by peers who want something different. You might think you’re strong-willed, but day after day of hearing how a top-tier research university position is the be-all, end-all of life can have strange effects on your psyche. I really do feel this is something we handle well at Wisconsin. Our Ph.D. graduates go on to a wide variety of positions, some in primarily teaching colleges, some in research institutions, some in industry, some in government. We do not consider the North American research university the be-all and end-all of life. We are not just trying to produce clones of ourselves. We really do strive to help each of our students get the best job among the jobs they want to get. Should we fire people who pick the wrong Final Four? A thought experiment touched off by Cathy’s latest post on value-added modeling. Suppose I’m in charge of a big financial firm and I made every trader who worked for me fill out an NCAA tournament bracket. Then, every year, I fired the people whose brackets ended up in the lowest quintile. This makes sense, right? Successful prediction of college basketball games involves a lot of the same skills you want traders to have: an ability to aggregate information about uncertain outcomes, fluency in quantitative reasoning, a certain degree of strategic thinking (what choices do you make if your objective is to minimize the probability that your bracket is in the bottom 20%? What if your fellow traders are also following the same strategy…?) You might even do a study that finds that firms whose traders did better at bracket prediction actually ended up with better returns 5 years later. Even if the effect is small, that might add up to a lot of money. Yes, the measure isn’t perfect, but why wouldn’t I want to fire the people who, on average, are likely to make less money for my firm? And yet we wouldn’t do this, right? Just because we think it would be obnoxious to fire people based on a measure predominantly not under their control. At least we think this when it comes to high-paid financial professionals. Somehow, when it comes to schoolteachers, we think about it differently. See, that’s what I mean, the ubiquitous Common Core approach to math teaching these days wouldn’t allow for either “games” or “mystery”: they would insist that your son provide a descriptive narrative of his thought process that explains how he got his answer, they would insist on him drawing some matrix or diagram to show who that process is represented pictorially. 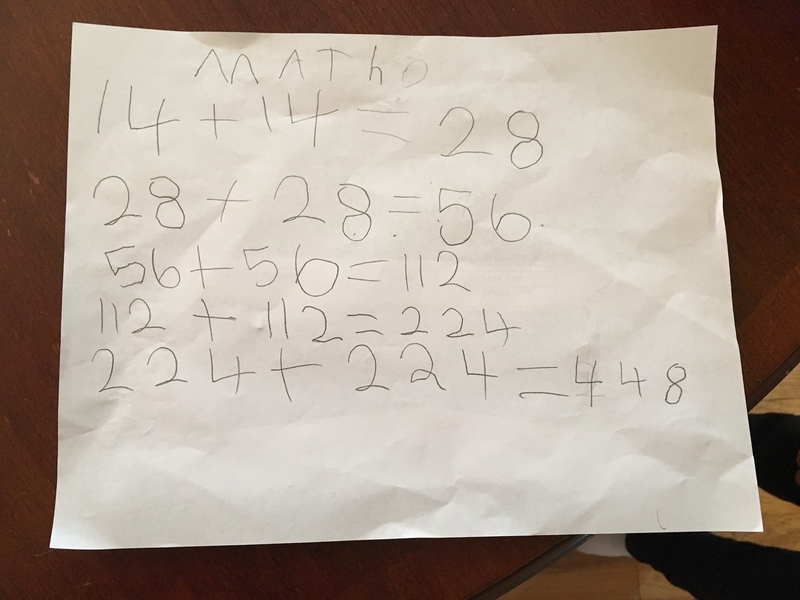 And your son would be graded on his ability to provide this narrative and draw this diagram of his thought process, not on his ability to get the right answer (which in child prodigies and genius, by definition, is out of the ordinary, probably indescribable). The author presents this as a special delivery of some much-needed real-world wisdom to the boringly conformist “good student.” But I think it comes off as free-floating nastiness directed at a kid asking a perfectly reasonable question. Discuss. This sends my “good” students into conniption fits. My cynical students enjoy watching these interactions. Basically, I think I like my cynical bad students more than my good students because the good students are wrong and the cynical bad students are right. I have been inexcusably out of touch with the controvery in Wisconsin about the adoption of the Common Core state standards for mathematics. I present without comment the text of a letter that’s circulating in support of the CCSSM, which I know has the support of many UW-Madison faculty members with kids in Wisconsin public schools. All discussion (of CCSSM in general or the points made in this letter) very welcome. We know that what we have been doing in the past does not work. Nationwide, over 40% of first-year college students require remedial coursework in either English or mathematics. For many of these students, completing their remedial mathematics (that is to say, high school mathematics) requirement will be a significant challenge on their path to their chosen college degree. The situation in Wisconsin mirrors the national one. Over the University of Wisconsin system as a whole, 21.3% of all entering freshmen in the fall of 2009 required remedial education in mathematics. Over the Wisconsin Technical College System, the mathematics remediation figure is closer to 40%. The CCSSM set a high, but realistic, level of expectations for all students. It is unrealistic, and unnecessary, to expect all students to master calculus (for example) in high school. That would be the “one size fits all” approach that is often brought up as an argument against the Common Core. Instead, the CCSSM attempts to identify a coherent set of mathematical topics of which it can be reasonably be said that they are essential for students’ future success in our increasingly technological and data-driven society. “College and career ready,” yes, but also life and citizenship ready. It is easy to point to a certain favorite topic and say that the Common Core delays discussion of that topic, or places it in a grade level higher than it has been taught previously. It is also dangerous. There is no merit in placing a topic at a grade level where students are unable to do more than repeat procedures without understanding or reasoning. (One example would be the all-too-frequent expectation that students compute means and medians of sets of numbers, with no significant connection to context, and no discussion of when it would make sense to use one rather than the other.) It is necessary to look at any set of standards as a coherent whole, and ask whether students who meet all expectations of the standards have been held to a sufficiently high level. Even for talented students, the rush to learn advanced topics and procedures should not come at the expense of students’ deeper understanding of the mathematical content being covered. Talented students also need quality guidance; they should not be rushed thoughtlessly for the sake of advancement. There are undoubtedly some professional mathematicians, scientists and engineers who claim that the CCSSM are insufficiently rigorous; it is our understanding that they are a small minority. We entreat you to keep Wisconsin in the group of States that are adopting the CCSSM. We see the consequences of failed educational policies in our classrooms every day, and we only have the well being of our students in mind. The CCSSM is the right balance: already far higher than our previous State standards but not beyond what one can expect from a majority of students. Beyond the Rhetoric: Improving College Readiness Through Coherent State Policy, accessed from http://www.highereducation.org/reports/college_readiness/gap.shtml on October 3, 2013. Report on Remedial Education in the UW System: Demographics, Remedial Completion, Retention and Graduation, September 2009, accessed from http://www.uwsa.edu/opar/reports/remediation.pdf on October 6, 2013. Findings of the Underprepared Learners Workgroup, accessed from http://systemattic.wtcsystem.edu/system_initiatives/prepared_learners/Findings.pdf on October 6, 2013. As promised, I was on daytime TV this week! The clip is available for posterity at the Today Show website. What’s interesting to me is the big discrepancy between the way this clip looked to a lot of my friends and colleagues and the way it felt actually to participate in it. Many of my friends were disappointed that I didn’t say more, and wished the discussion had been at a higher mathematical level. As for me, I walked out of the shoot feeling it had been a success. For one thing, Dr. Mrs. Q and I had been watching the show to get ready, and knew what to expect. It was pretty clear that no serious math lecture was going to happen. There was a planned question directed at me: “How long will it take for someone to answer this question [generalized Fermat]?” If that had happened, I had about 10 seconds planned in which I’d say “We don’t really know, and that’s what’s exciting, most of math remains a mystery even though we teach it in a way that makes it seem everything was settled centuries ago.” And it would have been great to have said that! But that would have been the absolute maximum amount of math possible to work into the segment. And once you’re on the air, things move very quickly, and things are not very tightly tied to the cue cards. Danica McKellar, who was on with me, handled the problem of content very intelligently; she understood perfectly well that it didn’t make sense to try to really explain a Diophantine question in the context of the show, so she made sure to tell viewers that they could read about it on her twitter feed, where she provided links to a full description. That seems to me a totally sensible approach to conveying information about math on live national TV. The thing we do in class is a great thing to do when you have an hour to talk to 200 people. What you do when you have 10 seconds to talk to 2 million people is totally different. Both of these seem like things you can totally do in 10 seconds, and things that are worth broadcasting to 2 million people if you get the chance. I think we were only partially successful with the first goal, but did fine with the second. For Galileo, the universe is written in the language of mathematics; for Descartes, the methods used in algebra and geometry teach us how to reason about anything, from philosophy to politics. Arguably, mathematics is fundamentally about writing–a set of rules that tell us what we are allowed to write and in what order. This seminar explores how mathematics’ emphasis on careful analysis, methodical argument, and logical proof can teach us to write in both scientific and nonscientific contexts. It will also examine the cultural and literary backgrounds of mathematical discoveries–the amazing, often funny stories behind the theorems scientists and engineers use every day. Our readings will come from philosophy and the history of science as well as Douglas Hofstadter’s wonderful book Gödel, Escher, Bach. That sounds amazing! I would love to teach a course like this, maybe someday as a FIG. But probably not as a MOOC. Perhaps an entirely new acronym is required. Recorded and posted by U Chicago grad student Zev Chonoles. What a strange and wonderful pleasure. As we’ve seen, there is an analogy between Z and C[T]. In fact, the analogy between Z and Fp[T] is even stronger; for example the theory of zeta functions is very similar for Z and Fp[T]. We don’t know the true reason why they are so similar; perhaps they are children of the same parents. But we don’t know who their parents are; their parents are missing. makes a mess. It is sweet because it makes things interesting. cake shop; it is a very nice cake shop. I could go on but you should really just read these yourself.